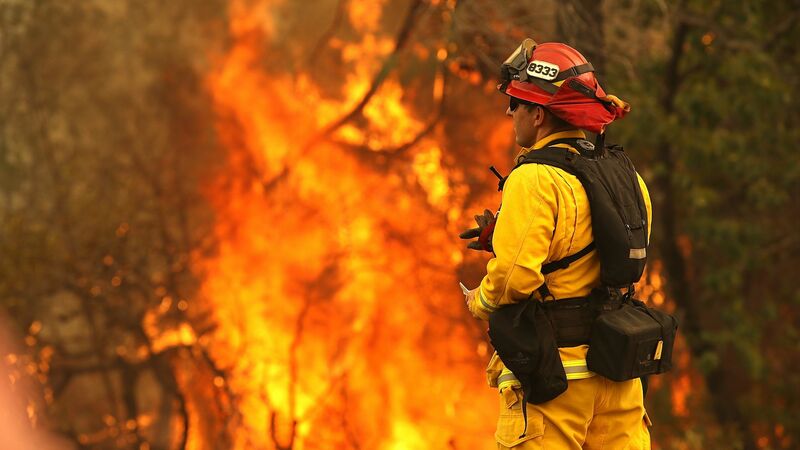 More than a dozen wildfires are burning in California, with the death toll rising to eight. Six of the fatalities have been due to the ferocious Carr Fire that roared into Redding, California. this has been the hottest July on record. Fires are burning up and down the state, with thousands of firefighters deployed on the ground and in the air. Some of the fires now rank among the 20 most destructive in California history. As of Monday morning local time, the Carr Fire had burned 98,724 acres and was 20% contained. Firefighters have been gaining greater control of the blaze since Saturday. The death toll from this fire may still rise, as several people in Redding are considered missing, according to officials. Meanwhile, the Ferguson Fire that has resulted in the shutdown of Yosemite National Park at the height of tourist season claimed another life — a firefighter based at Sequoia and Kings Canyon National Park who died while trying to contain the fire. As of Monday morning, the Ferguson Fire had burned 56,659 acres, and was 30% contained. Between the lines: California's changing climate — with hotter, drier summers and fire seasons that now stretch all year — is contributing to larger and more destructive fires that spread quickly. In the case of the Carr Fire, for example, the blaze jumped the Sacramento River, which would normally be considered a formidable fire break. These fires aren't just deadly, they're costly, too. In 2017, just four large California wildfires combined caused $18 billion in damage, making them the costliest in U.S. history, according to NOAA. More broadly, scientists have observed a trend toward larger wildfires in much of the West, along with wildfire seasons that start earlier, due to more rapid snowmelt in the spring and warmer, drier conditions. These shifts have links to global warming, according to numerous scientific studies. Wildfires are also getting more destructive because of construction encroaching on lands that traditionally burn, as well as decades of fire suppression policies over the years that has left more vegetation for fires to consume. Go deeper: A 30-year alarm on the reality of climate change.